11/24/2015: Added a 1918 advertisement. 10/15/2015: Added a link to a 1922 advertisement for a Fairmount valve lifter. 05/15/2011: Added a Fairmount 1/2x9/16 Inline Socket Wrench. 05/06/2011: Added a Fairmount "Fairalloy" 731A Open-End Wrench. 04/19/2011: Added a Lawson 8 Inch Angle Pipe Wrench. 01/22/2011: Added a Fairmount "Twin Coach" 1727 Open-End Wrench. 08/05/2010: Added a Fairmount "Cleve" Hub Wrench. 08/27/2009: Added a Fairmount "Fairalloy" 9725B Offset Box Wrench. 04/21/2009: Added a Fairmount 28-S Open-End Wrench. 04/19/2009: Added a Fairmount 1727 Open-End Wrench. 04/10/2009: Added a Fairmount 11 Inch Auto Wrench. 03/29/2009: Added a Fairmount 8039S Offset Box Wrench. 03/18/2009: Added a Fairmount 8727 Offset Box Wrench. 08/17/2008: Added a Fairmount "Protane" 308 Spark Plug Wrench. 07/27/2008: Added a Fairmount "Fairalloy" 27-C Open-End Wrench. 07/23/2008: Added a Fairmount "Cleve"  Open-End Wrench. 06/23/2008: Added a Fairmount 25 "Ford" Open-End Wrench. 06/14/2008: Added a Fairmount 26 Open-End Wrench. 05/14/2008: Added a Fairmount AN8505-17 Thin Hydraulic Wrench. 04/14/2008: Added a Fairmount AN8505-19 Thin Hydraulic Wrench. 03/20/2008: Added a Fairmount 207A Single-Open "Spud" Wrench. 03/13/2008: Added a Fairmount "Cleve" S-Shaped Wrench. 03/11/2008: Moved to a separate page. 12/31/2007: Added a Fairmount 730-A Open-End Wrench. 12/15/2007: Added a Fairmount 9723 Offset Box Wrench. 12/03/2007: Added a Fairmount "Cleve" 731 Open-End Wrench. 10/11/2007: Added a Fairmount 629D Thin Open-End Wrench. 11/04/2006: Added a Fairmount 9727 Offset Box Wrench. 10/22/2006: Added a Fairmount Auto Wrench. 10/18/2006: Added a Fairmount 723 Open-End Wrench. Fairmount Tool and Forging was founded in 1917 in Cleveland, Ohio, and became well known as a contract manufacturer for automobile tool kits. The company also specialized in tools for automobile body work. Currently we have only very limited information for this company. The December, 1917 edition of Industrial Management printed a notice of the founding of Fairmount Tool & Forging on page 436d, with officers listed as J. Wentworth Smith, B.G. Gilmore, and Charles W. Yarham. A later listing in a 1931 "Corporations and Directors" directory confirms that Fairmount Tool and Forging was incorporated in 1917, with J. Wentworth Smith as President. The advertisement at the left was published on page 539 of the January, 1918 issue of the Chilton Automobile Directory, just shortly after the founding of the company. It lists the company address as 10585 Quincy Avenue in Cleveland and notes their products as tools, tool kits, and forgings. The advertisement at the left from the June, 1922 edition of The Automobile Journal shows a Fairmount valve lifter. A small brochure from 1928 for their automobile body tools gives the company address as 10611 Quincy Avenue in Cleveland, and offers their new auto body work instruction manual "The Key to Metal Bumping" for $0.25 postpaid. (As an aside, this little book became very popular, and remains in print today!) The brochure shows the use of an inverted diamond logo enclosing the "FTF" company initials. Based on information printed in the 1953 Third Edition of "The Key To Metal Bumping", by 1953 Fairmount had become a subsidiary of Houdaille Industries, an industrial conglomerate. Fairmount remained as a division of Houdaille until July of 1984, when the company was acquired by the Martin Sprocket and Gear Corporation. The Fairmount operations were renamed as the Martin Tools division, and the line of tools continues in production today under the Martin brand. A check for patent records turned up two patents assigned to Fairmount, one for a valve spring lifter and the other for a wrench set holder. No trademark registrations have been found for Fairmount. Currently we do not have any Fairmount catalogs. Fig. 1. Fairmount 9 Inch Auto Wrench. Fig. 1 shows a Fairmount 9 inch auto wrench, marked with "Fairmount Cleve" forged into the shank. Fig. 2. Fairmount 11 Inch Auto Wrench, with Inset for Marking Detail. Fig. 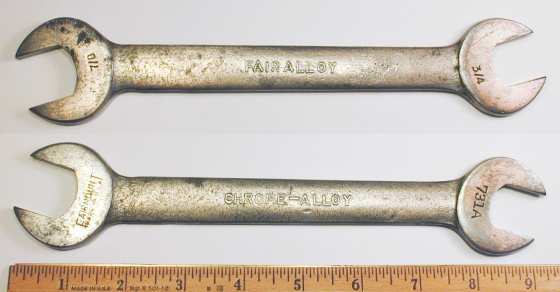 2 shows a Fairmount 11 inch auto wrench, marked with "Fairount Cleve" and "USA" forged into the shank. Did anyone notice the typo on this wrench? Years after taking the photograph, we finally noticed that the "M" is missing from the forged-in company name! Fig. 3. Fairmount "Lawson" 8 Inch Angle-Head Pipe Wrench, with Insets for Reverse and Side View. Fig. 3 shows a Fairmount "Lawson" 8 inch angle-head pipe wrench, marked with "Lawson" and "Forged Steel" forged into the shank, with "Fairmount Tool & Forging Inc." and "Cleveland Ohio Made in U.S.A." forged into the reverse. The shank is also marked with a forged-in FTF logo. The overall length is 8.0 inches closed and about 9.3 inches fully extended. The finish is black paint. The Lawson pipe wrench design is covered by patent #1,362,014, filed by G.C. Lawson in 1920 and issued later that year. It's not known whether this patent was licensed by Fairmount, or if the patent had already expired by the time this tool was produced. Fig. 4. Fairmount "Protane" 308 5/8x5/8 Spark Plug Wrench. Fig. 4 shows a Fairmount 308 9/16x9/16 spark plug wrench, marked with "Protane Corpn" forged into the shank, with "Fairmount Cleve." forged into the reverse. Fig. 5. Fairmount "Cleve" 1-7/16x2-1/8 Hub Wrench. Fig. 5 shows a Fairmount hub wrench with a 1-7/16 open end and a 2-1/8 hex box opening, marked with "Fairmount Cleve." forged into the shank. The overall length is 8.7 inches, and the finish is plain steel. Fig. 5B. Fairmount "Cleve" 1/2x9/16 Inline Socket Wrench, with Inset for Construction. Fig. 5B shows a Fairmount 1/2x9/16 inline socket wrench, stamped "Fairmount Cleve." on the shank. This type of early socket wrench was intended to be turned with an open-end or adjustable wrench. The hex socket openings have been forged into a bar of steel, and the 1/2 square shank has been ground to size and hardened to withstand the turning force. The next figures show two examples of the Fairmount 723 open-end wrench. Fig. 6. Fairmount "Cleve"  3/8x7/16 Open-End Wrench. Fig. 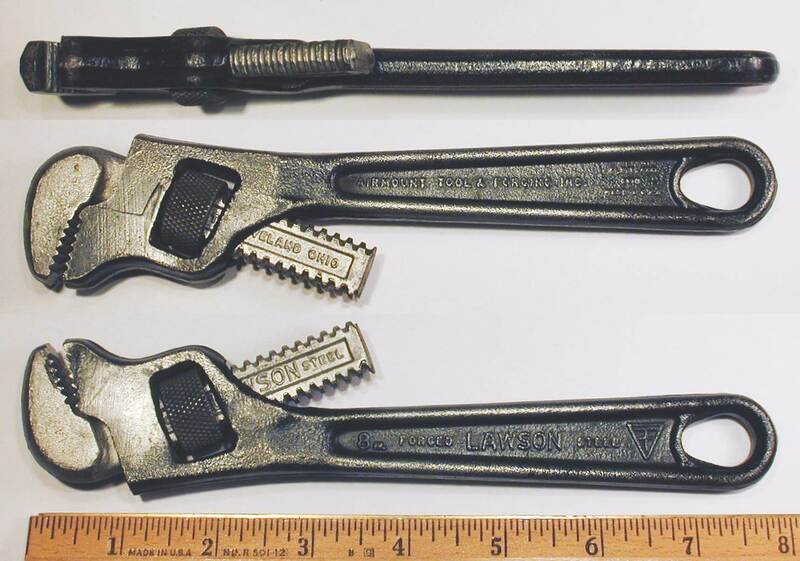 6 shows a Fairmount open-end wrench with measured sizes 3/8x7/16, corresponding to the industry-standard No. 723 model. The shank is marked "Fairmount Cleve." in forged raised letters. The overall length is 3.9 inches, and the finish is plain steel. Fig. 7. Fairmount 723 3/8x7/16 Open-End Wrench. Fig. 7 shows a Fairmount 723 3/8x7/16 open-end wrench, stamped "Made in U.S.A." with the Fairmount logo on one face. The overall length is 4.5 inches, and the finish is plain steel. Fig. 8. Fairmount 25 "Ford" 1/2x19/32 Open-End Wrench, with Inset for Marking Detail. Fig. 8 shows a Fairmount 25 1/2x19/32 open-end wrench produced for Ford, stamped on the face with "Made in U.S.A." and the Fairmount logo, and with the Ford script logo as well (see inset). The shank is marked "Fairmount, Cleve." in forged raised letters. The overall length is 5.4 inches, and the finish is black paint. Fig. 9. Fairmount 26 1/2x11/16 Open-End Wrench. Fig. 9 shows an open-end wrench in a somewhat unusual size, a Fairmount 26 1/2x11/16 open-end wrench. The face is stamped "Made in U.S.A." with the Fairmount logo, and the shank has "Fairmount U.S.A." in forged raised letters. The overall length is 6.4 inches, and the finish is black paint. Fig. 10. Fairmount 28-S 5/8x25/32 Open-End Wrench. Fig. 10 shows a Fairmount 28-S 5/8x25/32 open-end wrench, stamped on the face with "Made in U.S.A." and the Fairmount logo. The reverse shank has a forged-in code "A" (not shown). Fig. 11. Fairmount 730-A 5/8x7/8 Open-End Wrench. Fig. 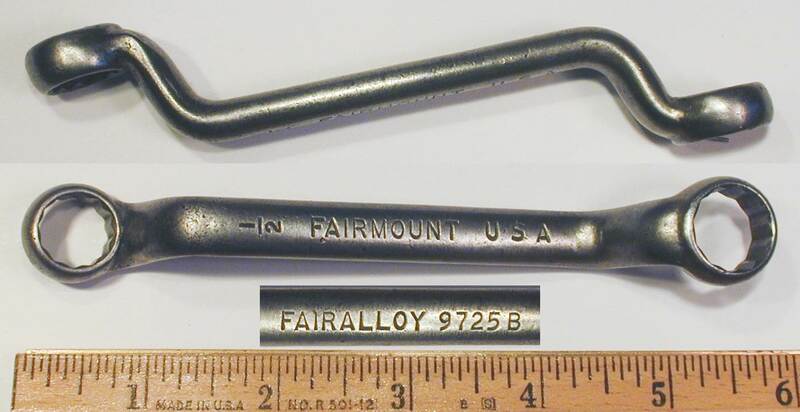 11 shows a Fairmount 730-A 5/8x7/8 open-end wrench, stamped "Made in U.S.A." with the Fairmount logo on the face, with "Fairmount U.S.A." forged into the shank. The overall length is 8.7 inches, and the finish is black paint. This wrench was found with some of its protective cosmoline coating still on the faces, suggesting that it received little or no use. Fig. 12. Fairmount "Cleve" 731 3/4x13/16 Open-End Wrench. Fig. 12 shows a Fairmount 731 3/4x13/16 open-end wrench, stamped "Made in U.S.A." on the face, and with "Fairmount Cleve." forged into the shank. The overall length is 8.6 inches, and the finish is cadmium plating. The next two figures show examples of the Fairmount 1727 wrench, with minor differences in the markings. Fig. 13. Fairmount 1727 9/16x5/8 Open-End Wrench, with Inset for Reverse Detail. Fig. 13 shows a Fairmount 1727 9/16x5/8 open-end wrench, stamped "Fairmount Cleveland" on the face. The shank is stamped "Chrome Molybdenum" on the front, with "Fairmount Cleve" on the reverse. The overall length is 6.5 inches, and the finish is nickel plating, with losses due to wear and rust. Fig. 14. Fairmount "Twin Coach" 1727 9/16x5/8 Open-End Wrench, with Inset for Reverse Detail. Fig. 14 shows another Fairmount 1727 9/16x5/8 open-end wrench, stamped "Twin Coach" and "Fairmount Cleveland" on the shank, with "Chrome Molybdenum" on the reverse. The "Twin Coach" marking is made in a distinctive format, suggesting that it is the logo for a specific customer. Fig. 15. Fairmount "Fairalloy" 27-C 9/16x11/16 Open-End Wrench, with Inset for Reverse Detail. Fig. 15 shows a Fairmount 27-C 9/16x11/16 open-end wrench, stamped "Made in U.S.A." with the Fairmount logo on the face. The shank has forged-in markings "Chrome-Alloy" on the front, but partially ground off, with "Fairalloy" forged into the reverse. The overall length is 6.6 inches, and the finish is chrome plating with polished faces. Fig. 16. 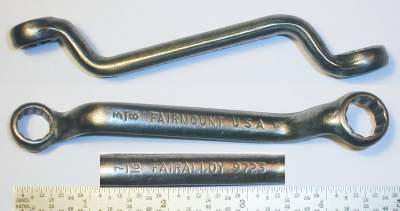 Fairmount "Fairalloy" 731A 3/4x7/8 Open-End Wrench, with Inset for Reverse. Fig. 16 shows a Fairmount 731A 3/4x7/8 open-end wrench, stamped "Made in U.S.A." with the Fairmount logo on the face. The shank is marked with "Chrome-Alloy" forged into the front, with "Fairalloy" forged into the reverse. The overall length is 9.2 inches. The original finish was chrome plating, but much has been lost due to wear and rust, with traces of the copper undercoating visible in some areas. Fig. 17. 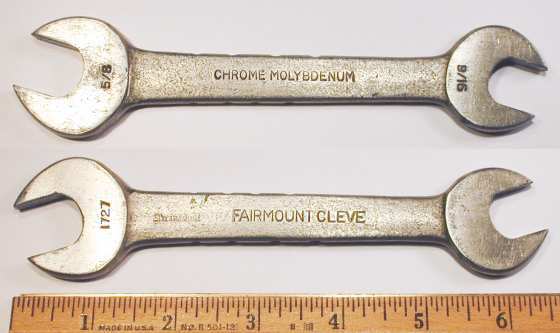 Fairmount "Cleve" 1/2x9/16 S-Shaped Open-End Wrench. Fig. 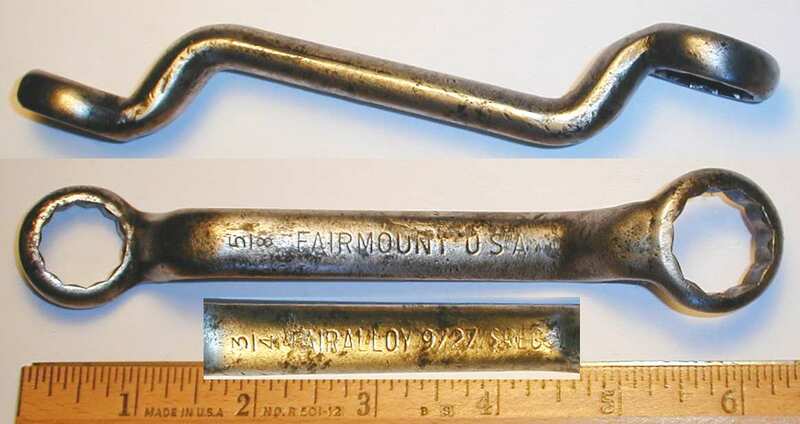 17 shows a Fairmount 1/2x9/16 S-shaped open-end wrench, marked with "Fairmount Cleve." forged into the shank. Fig. 18. Fairmount 629D 5/8x3/4 Check-Nut Wrench. Fig. 18 shows a Fairmount 629D 5/8x3/4 check-nut wrench, stamped "Made in U.S.A." on the face. The overall length is 6.9 inches, and the finish is black paint. Fig. 19. Fairmount 207A 1-5/32 Single-Open Spud Wrench, with Inset for Marking Detail. Fig. 19 shows a Fairmount 207A 1-5/32 single-open "spud" wrench, stamped "Made in U.S.A." on the shank. The overall length is 16.1 inches, and the finish is plain steel, with pitting due to rust. Fig. 20. Fairmount 8727 9/16x5/8 Offset Box-End Wrench, with Insets for Side View and Reverse Detail. Fig. 20 shows a Fairmount 8727 9/16x5/8 offset box-end wrench, marked "U.S.A." with the model number and fractional sizes. The overall length is 9.8 inches, and the finish is plain steel with traces of black paint. Fig. 21. Fairmount 8039S 1-1/4x1-3/8 Offset Box-End Wrench, with Inset for Side View. Fig. 21 shows a Fairmount 8039S 1-1/4x1-3/8 offset box-end wrench, marked "U.S.A." with the model number and fractional sizes. The overall length is 18.6 inches, and the finish is nickel plating. Fig. 22. Fairmount 9723 3/8x7/16 Short Offset Box-End Wrench, with Insets for Side View and Reverse Detail. Fig. 23. Fairmount 9725B 1/2x9/16 Short Offset Box-End Wrench, with Insets for Side View and Reverse Detail. Fig. 24. Fairmount 9727 Special 5/8x3/4 Short Offset Box-End Wrench, with Insets for Side View and Detail. The "Spec" marking probably indicates a special-order item, as the 9727 model number would normally indicate 9/16x5/8 openings, according to the Industry-Standard Wrench Sizes. Fig. 25. Fairmount AN8505-17 1-5/16x1-3/8 Thin Hydraulic Wrench, with Inset for Reverse Detail. Fig. 25 shows a Fairmount AN8505-17 1-5/16x1-3/8 thin hydraulic wrench, stamped with the Fairmount logo and "Made in U.S.A." on the shank. The AN series model number indicates that this wrench was likely made for a military contract, but currently we don't have any information on the specific application. Fig. 26. Fairmount AN8505-19 1-7/16x1-1/2 Thin Hydraulic Wrench, with Inset for Reverse Detail. Fig. 26 shows a Fairmount AN8505-19 1-7/16x1-1/2 thin hydraulic wrench, marked with "Fairmount U.S.A." forged into the front, with the AN series model number forged into the reverse. The overall length is 9.3 inches, and the finish is plain steel with some of the original black paint.